Perry’s ID3 Tag Viewer parses ID3v1 and ID3v2 tags stored in MP3 files. Not only does it extract common data such as the Artist, Album and Title, but it also extracts frames that contain data which MP3 players and tagging software simply do not care about, such as Private (PRIV) frames, User Defined Text Information (TXXX) frames, and other custom third-party frames that might contain hidden/encrypted data. 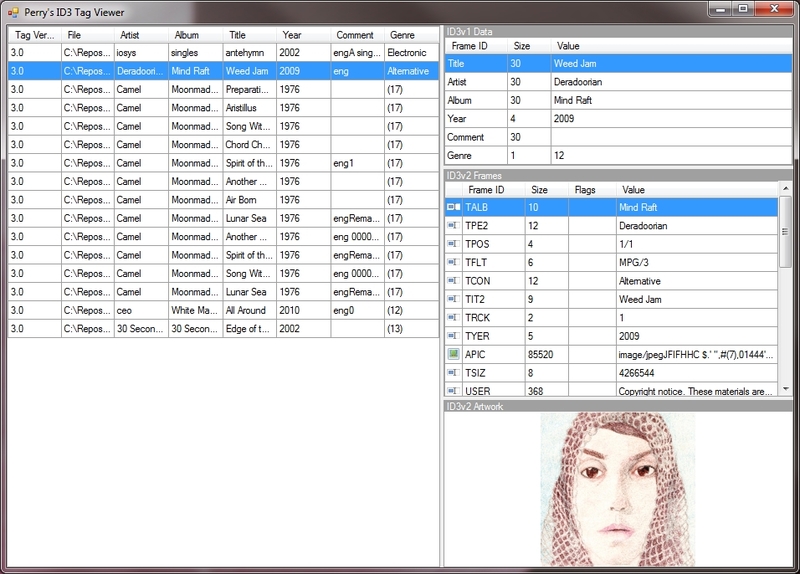 Perry’s ID3 Tag Viewer utilizes a custom ID3 tag parsing library written from scratch, based on the official specifications at ID3.org. Also check out the introductory post here. July 20, 2011 – uploaded v0.6. July 19, 2011 – uploaded v0.5. Drag and drop multiple files from Windows Explorer. View ID3v1 and ID3v2 (2.2.0, 2.3.0, 2.4.0) tags, including most or all ID3v2 frames defined in the official specification. Reveal hidden frames and data within an ID3v2 tag that you didn’t know existed! Software such as iTunes and MusicBrainz can add hidden data to your MP3 files inside uncommon ID3v2 frames (see screenshots). This project is currently undergoing beta testing. Your feedback will help make this software better. All you need to do is download the software (it’s free!) and e-mail any problems or requests that you may have to perry@glassocean.net or leave a comment here on this page. I’ll definitely read your feedback, and I’ll respond to as many people as I can. Support for viewing multiple APIC frames stored in a single tag. Useful for front/back disc artwork. Implements Perry’s ID3 Tag Library v0.3 and those changes. New ID3v2 Info panel which displays the tag size, frame count, and malformed tag warning. Installation – Extract the contents of the zip file to a folder on your hard drive, then run the application (Perrys ID3 Tag Viewer.exe). Usage – Simply drag and drop MP3 files into the left grid. The left grid displays aggregated tag info (preferring ID3v2 entries over ID3v1 entries) and the right grid displays actual ID3v1 and ID3v2 frame info. All of my software comes with the same disclaimer. I do test and use my own software programs, and while I’m pretty confident there are no dire consequences to using them, I can’t be held liable for any damage caused by the use of my software, whether due to bugs, unforseen functionality or any other reason. I always recommend that you test my software on a sample before attempting the real thing. This will give you an idea of how it works and what to expect. Thank you for your interest in my software! I am using your tool to analyze a problem I have with a Dension Gateway 100 in my car. It does not always display the song artist correctly. Currently I am checking if there is a problem with the ID3 tags. Your tools seems to show all frames, other tools I use like Mp3Tag only show frames that it suppots. Your tool works great, first of all thanks for that. I see sometimes a red text saying ‘ malformed tag detected’ . This may well be the problem I am looking for but cannot find what is wrong with the ID3 tag. Tried comparing a ‘ malformed’ mp3 file with a good one but cannot see a significant difference. Could it have something to do with the padding bytes after the frames? One with the malformed error and the other one without the error. Can you please have a look? Can you explain why/when this error occurs and what is wrong with the frames/tags/file? Hi Ron, I have a newer version of the Tag Library/Viewer which parses frames and detects malformed tags more accurately. I checked your MP3s in this version; both look to be fine and neither are reporting a malformed tag, the artist appears correct for both. I can see both MP3s have the same frame data, but the one you labeled malfunction has a padding size of 6 where the original has a padding size of 2027. So I’m not sure about your Dension Gateway 100 error… but I hope this info helps. I hope to release the new version soon; I’m just making sure the tag writing features work well first. Perry, is there a script (java or php) which can get id3 tag artwork for display? Yeah I just never finished that feature and kind of lost interest in the project over time. Might return to it one day though! but how do i close the file again. So how to release the file? Hi Perry The links to the id3 tag viewer are not working, for there are spaces in the links which is forbidden in URLs. I’m not sure why the URL has those spaces, and if you did it like that [in which case how in heavens has anyone been able to download the app?] Or whether you did it correctly but it has somehow been changed recently [by a hacker?]. Thanks for informing me, it turns out my web host (1and1) had some DNS issues that brought my subdomains offline and I had to re-create them to fix it. Should be working now. I am having the same problem as Mark Donners has asked (which is left silent for almost 10 months now). I wanted to extend the renaming process by adding the artist name in front of the name, so it would be like “Mariah Carey – Butterfly.mp3” “Elton John – Sacrifice.mp3”. Your project helps me to read the artist name using the following code. Now, because the file is still in use by your dll file, I cannot rename the file. Please help us in how to release the file from your dll file, after reading the tags. The links in the page you have directed me to, takes me to a dead end. I cannot download the project by the given links. Nothing comes up. Please check and verify the links are working properly. What about the Github repo? github link worked. And I made Dispose method for every form, so now the mp3 file in use won’t get locked. I will send you the converted project (to Visual Basic .net 2010) for your perusal. Nice work thank you! I’ll upload the new code when I get a chance.